With a new year comes new opportunities! 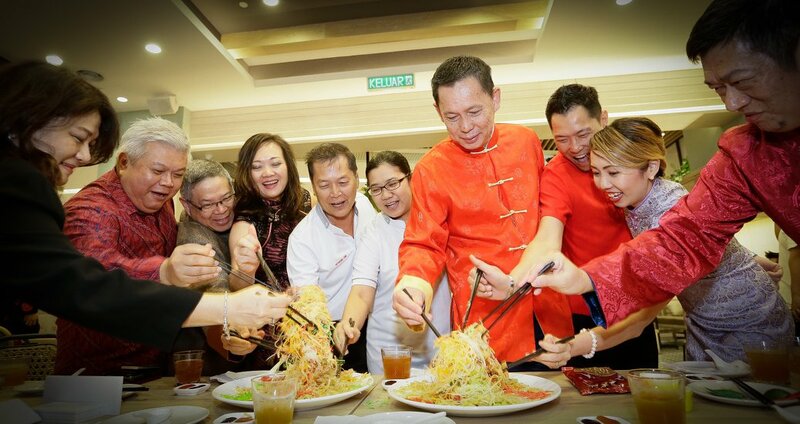 Sunway Malls reunited to celebrate the coming Lunar New Year at Sunway Putra Mall in grand fashion. 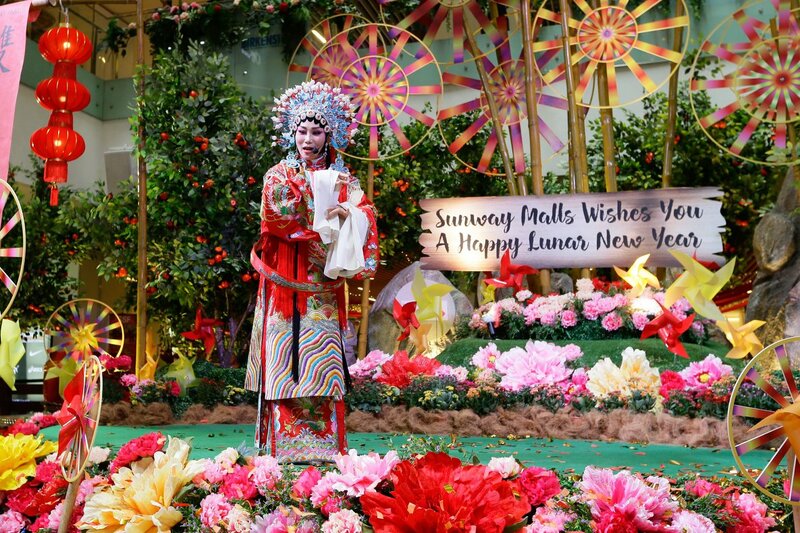 With the festive season coming to full swing, each Sunway mall is decked out in extraordinary Lunar New Year fashion. Each mall has their unique take on this year’s festivities with the unifying theme of celebrating traditions. From pinwheels to an homage to a water canal town, Sunway Malls will be the highlight of your shopping destination this season! “In many ways, the coming together to celebrate the festive season has always been Sunway Malls' hallmark, as we embark to expand our footprint in key urbane markets. We are fortunate too that Sunway Malls has grown from a single mall operation to five-mall operation which enabled us to reach wider and further,” said HC Chan, Chief Executive Officer of Sunway Malls and Theme Parks. In the spirit of the festive season, children from Yayasan Sunbeams Home and Yayasan Chow Kit (YCK) were invited to join the Lunar New Year Launch. They were brought to Funscape by Cobay for a game session, followed by a shopping spree at Good2U as they sponsored a set of clothing for all the underprivileged children. The celebration began with a Lion Dance performance that marched into the Main Concourse with the VIPs in lieu. It continued with Golden Drums performance led by 15 drummers from Sunway University. Representatives from Sunway Malls; HC Chan, CEO of Sunway Malls & Theme Parks; Kevin Tan, COO of Sunway Malls; KS Wong, Senior General Manager of Sunway Velocity Mall; Phang Sau Lian, General Manager of Sunway Putra Mall; Chow Heng Wah, General Manager of Sunway Carnival Mall, and Albert Cheok, Centre Manager of Sunway Giza were invited to the stage to officiate the event together. 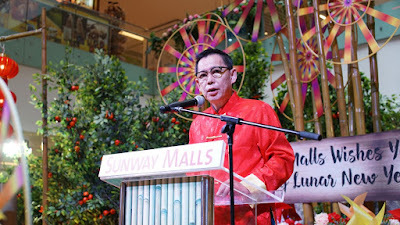 The event kick-started as the storyteller unveiled five captivating stories, depicting each of Sunway Malls and the VIPs revealing specially made miniatures that symbolises the traditional elements of each mall. For a stunning finale, a synchronized strike of the last beat of the drums became the cue for the Chinese Opera performance to signal the end the event. Not forgetting to embark on an act of kindness this festive season, Sunway Malls is an advocate of charitable causes hence encourages the malls and their community to give to those in need. 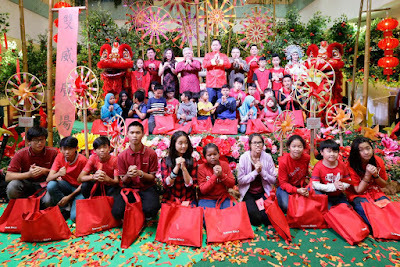 For this Lunar New Year, Sunway Malls is focusing on lesser fortunate families as it is a time for reunion and to celebrate. Although celebrating as one in the launch, each mall under the Sunway Malls brand have different themes of celebration to capture the different markets they cater to. Sunway Putra Mall’s Lunar New Year is themed ‘Wind of Blessings’. The mall is transformed into a mandarin orange garden adorned with colorful pinwheels, majestic lanterns and a traditional pagoda. In Chinese folklore, the pinwheel known as “Feng Che” is a traditional toy to turn one's luck around or turn obstacles into opportunities when it begins to spin with the wind and they have become quite elaborate and are used during the Lunar New Year. Shoppers can take a stroll in the garden, feast their eyes on the green landscape and enjoy the gentle scent of citrus along the pathway. There is also a rustic wooden bridge over a man-made pond surrounded with mandarin orange trees that is perfect for a photo opportunity. A complimentary photo booth area is also available throughout the period for public to take as many pictures as they wish. Wish upon the Tree of Blessings for a special someone and the mall will grant selected wishes. It is believed that the higher the joss paper is dangled on the tree, the higher the chance of your wishes to come true. Also, look out for festive essentials at the Spring Bazaar and the Flower Market for some fresh and colourful blooms. At Sunway Pyramid, the theme is ‘The Merriment of Spring’. Inspired by Zhouzhuang, a water town in China known for its canals, the LG2 Orange Concourse is decorated with cherry blossoms and willows. An oriental arch towers over the entrance of the concourse which is flanked by two imperial guardian lions (also known as foo lions). A river flows in between the area too! Take photos as you stand on top of a bridge while the river flowing underneath. Spot classic Lunar New Year elements such as red lanterns, red cloths and spring couplets fill the concourse. 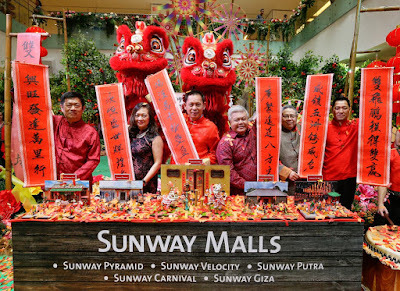 In Chinese culture, a circle represents unity which is one of the elements of the Lunar New Year setup at Sunway Pyramid. When you stop by the mall, try to spot the circle somewhere at the centre of the concourse! Creating unique experiences is one of the mall's missions, and what better way than at the interactive Photo Booth area which features a traditional tea house set-up where shoppers can pose and get a complimentary photo print to keep a memento of their visit. A variety of stalls selling beard candy, traditional candies, calligraphy, fresh flowers, and traditional costumes compliment the entire concourse. Shoppers can also enjoy lion dance performances every Saturday at the Concourse. 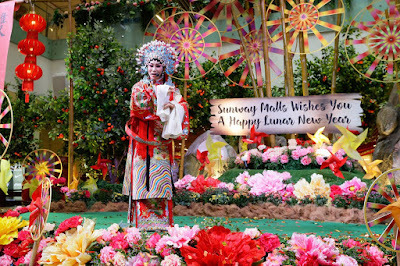 Up north in Penang, Sunway Carnival Mall will also celebrate ‘The Merriment of Spring’. The merriment of the Lunar New Year celebrations are evident with some great performances over the five weekends such as Season Drum, Dragon Dance, Chinese Cultural Dance, Chinese Music Orchestra and God of Prosperity Walkabout. Shoppers can look forward to play Chinese traditional games like Chinese chess, aka the ‘xiangqi’, Chinese shuttlecock or ‘jianxi’, ‘Hit the Pot’ and many more with their kids or friends here! Also, don’t miss out the opportunity to try some traditional sweets that instantly brings back happy memories of childhood like Dragon's Beard candy, ‘Ting Ting’ candy, ‘Tanghulu’ (candied fruit on a stick) and ‘Muah Chee’ (cooked glutinous rice coated with ground peanuts) on every Saturday. Apart from that, shoppers can have fun with their kids and take some picture-perfect photos clad in the Chinese traditional costume at our dress up corner, and get their photos printed for free on selected days. The dress up corner is free and available for kids on every Saturday and Sunday from 10 am until 10 pm. Also going back in time with ‘A Celebration Of Legacies’, Sunway Velocity Mall’s décor is inspired by Bai Jia Xing, The Hundred Family Surnames, a book listing all of the known Chinese surnames in use during the tenth century, visitors will find surnames adorning lanterns and major decorations – definitely a call for visitors to embark in your own treasure hunt for your particular surname. Take a walk up the main bridge pagoda for a stroll through its main theme of lanterns and to enjoy the view of the largest indoor flower market. Take in the breathtaking fragrance of the fresh flowers and plants in this indoor setting meant to tantalize your sense of sight, smell and touch. On ground, pagoda-like booths encase the Chinese New Year offerings, such as cheongsams, accessories, hampers and CNY cookies. Infused with all the olden charm is a mix of the neo-futuristic with LED cherry blossom trees, an enchanting sight amongst the traditional Chinese courtyard. In line with the traditional aspect, the mall has also put together several performances and activities to reflect the theme. Grab goodies when you catch the God of Prosperity on his walkabouts, and get into the excitement with lion dance performances, drum ensembles, Chinese diabolo performances, and Yamaha’s instrumental performances. In Kota Damansara, Sunway Giza is abuzz with weekend bazaars and a Lunar New Year fair. Shoppers can browse through selections of cookies, hampers, clothes, festive décor for the home and more at the bazaar. With each Sunway mall celebrating the Lunar New Year grandly this year, Sunway Malls looks set to start 2018 with a strong foothold in the retail and shopping mall industry.